The final step in our Quick Start Guide is to install the sample widgets. A widget is a small block that performs a specific function. Widgets can be added in sidebars as well as other widget-ready areas on your web page. The home page design and functionality of our themes are controlled by the use of widgets. All of our themes have an exported widget file that can be found in the XML folder of your theme files. 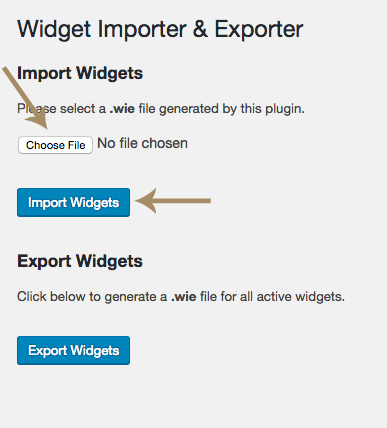 If you haven't already, you'll want to install the Widget Importer & Exporter plugin before following the steps below. 1. Make sure you have installed ALL the required plugins for your site. This is very important before proceeding to the next step. 3. Browse your Computer for the themename-widgets.wie file (in the XML folder,) select it and click IMPORT WIDGETS. 4. Once you do this, all the widgets from our demo site will be installed. 5. You can now go to APPEARANCE > PLUGINS, locate the Widget Importer/Exporter plugin, Deactivate and Delete it. Congratulations! You've just completed the basic setup of your new website! If you look at your site now, it will look very different than a few steps ago. It should start looking a little more like the demo. There are still a few more tweaks and customizations to make, but you're almost done! Your next step is to go to the Theme Documentation area and choose your theme. We'll take you on a step-by-step guide to make sure everything is in order.